One of the many outstanding models unveiled at the LA Auto Show is the Chevy Colorado ZR2 offroad compact pickup, expected to go on sale in early 2017. Already down the road in these parts, though, waiting for arrival of competition such as the ZR2, is Toyota’s new entry into that rugged category, the 2017 Tacoma TRD Pro 4X4 Double Cab. 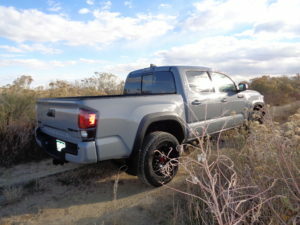 The TRD Pro showed up this fall, an enhanced package upgraded from the Tacoma TRD Off-Road unit. An internal bypass coil-over-shock setup, with dampers featuring 2.5-inch aluminum housings, lends a 1-inch suspension lift. Adding to the increased ride height are beefed-up rear leaf springs. Its exterior finish in a color called “cement” drew comments split evenly between favorable/unfavorable. 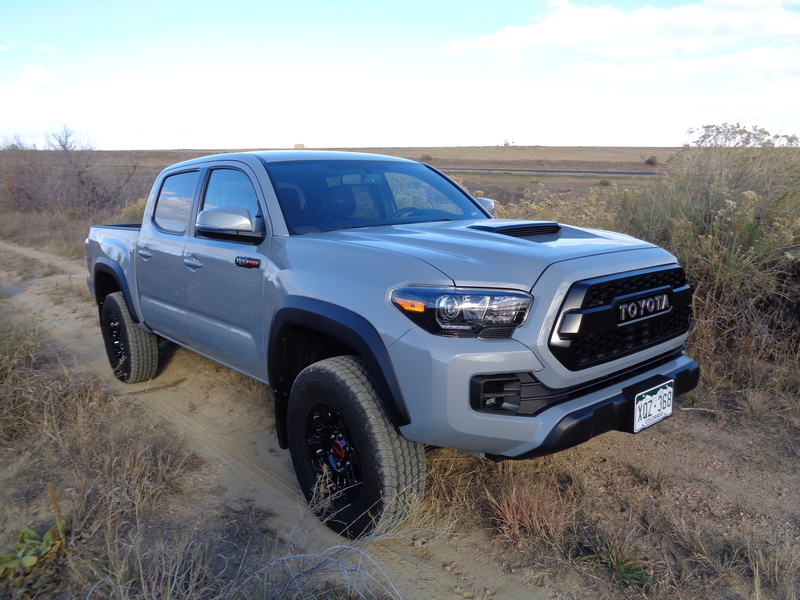 Accenting the light color is a prominent Toyota heritage-inspired front grille, blacked-out hood scoop, black fender flares, TRD black alloy wheels with Goodyear Wrangler All-Terrain Adventure 265/70R16 tires. Toyota’s old 4.0-liter V-6 has been replaced with the new Atkinson-cycle 3.5 V-6 which adds direct-injection when more revs are needed to deliver more power. Horsepower has increased to 278 from 236, and torque is rated at 265 lb.-ft. A 6-speed automatic transmission offers quicker and smoother shifts than the former 5-speed. The TRD Pro is also available with a 6-speed manual transmission. The review model delivered to me was equipped with the automatic, which teamed well with the V-6 in two-wheel drive, four-wheel drive and four-wheel low range. The transfer case and automatic limited-slip differential are electronically controlled. The push of a “crawl” button in 4Lo allowed me to guide the Tacoma downslope in tough terrain at about 3 miles per hour without braking. A Multi-Terrain Select system offers a five-mode regulation of wheelspin. Interesting is an integrated inclinometer or tilt gauge showing angles of slopes in side roll and front and rear pitch while offroading in uneven terrain. My offroading venture lowered the Tacoma’s overall fuel mileage average to 17.6; its EPA estimate is 18/23. Built at the Toyota truck plant in San Antonio, the Tacoma TRD Pro is a heavyweight at 4,450 pounds on a wheelbase of 127.4 inches. Driver and passenger enjoy fairly roomy front-seat area, though rear-seat legroom is tight. Leather-trimmed front seats are heated. TRD Pro logos decorate the headrests. Highlighting interior accommodations are Entune Pemium Audio with integrated navigation and Bluetooth. The pickup’s 5-foot bed is accessed readily with an easy-drop tailgate. An easy-drop tailgate lends access to a 5-foot bed. The tougher build of the TRD Pro comes with a price jump. Optional items such as glass-breaking sensor, paint-protection film, mudguards and bed mat added to the base price of $42,760 lifted the sticker total to $45,087. Eleven months ago, in December, with outdoor temp at 20 degrees and snow on the ground, I drove a 2016 Toyota Tacoma TRD 4X4 Sport Double Cab to the Terry Bison Ranch just across the state line into Wyoming. That Tacoma, fairly well-equipped, was $10,000 cheaper at $35,280, than this week’s TRD Pro. With the same 3.5 engine and 6-speed automatic transmission, it performed more briskly than the beefed-up TRD Pro. The ’16 model averaged 20.2 miles per gallon.